It can be really useful through the day to find time to pause. To notice when you feel a sense of busyness, rushing, doubting – and to notice how this feels: how it feels in your body and where you experience these feelings and sensations. Often we experience this as constriction or tightness in the belly, chest, perhaps in the hands or around the eyes. The first step in creating change is to notice, to become aware. Then to simply take one mindful breath, and in that breath we can feel a shift from contraction to expansion. One breath will open the space within and that space will continue to grow and expand . Within this moment of presence there is an acceptance of what is. Acceptance creates a sense of expansion and freedom within. From here we open ourselves for more creativity and confidence to flow. We are not looking to change or fix but to shift the feeling from contraction to expansion and our awareness from wishing things were different to presence and acceptance. Here is a short practice that can help you become aware of holding, constriction and tension in the body and how to change that experience through awareness, acceptance and action. The more we practice these skills, the easier and more effective they become and over time they become another tool you can draw upon whenever and wherever needed. Nadi Shodhana (alternate nostril) breathing is an effective way to cultivate feelings of balance and wellbeing. There are many ways to enjoy this pranayama and here I invite you to explore a creative approach using visualisation. This can be performed in a comfortable seated position or resting in savasana. Always ensure the breath is relaxed, smooth and subtle. Enjoy the benefits of a mindful, quiet practice. Focusing on our breath helps to take our mind inward and create one pointed focus. When you actively use the breath as a tool to enter a deeper state of awareness in any postures, your asana practice will radically change. It will flow. It will be smooth. It will energise and it will also calm your entire being. (extract from ‘Asana Pranayama Mudra and Bandha by Swami Satyananda Saraswati). In this workshop, you will explore pranayama (yogic breathing) to deepen your yoga practice, nourish your body and quieten the mind. Breathing in, I know I’m breathing in. Breathing in makes my calm. With the in-breath, I smile. Breathing in, there is only the present moment. Breathing out, it is a wonderful moment. The word pranayama is comprised of the sanskrit words “prana” meaning breath or life force and “ayama” to length or expansion. This practice of controlled breathing helps the energy to flow more easily into the nadis or energy pathways and koshas (layers) of the body. The koshas can be visualised as the rings inside a tree trunk, where the outer layer is the physical body, moving inward to the energy (pranic) body, the thinking mind, inner wisdom and spirit. When we influence the flow of prana in the energy body through pranayama its effects penetrate every cell and fibre of our being. When practicing pranayama, choose an environment that is clear, clean and free from distractions. Begin by observing your natural, spontaneous breath; breathing through the nostrils. As you connect with your breath cycle, observe the four phases of the breath: the inhalation, retention, exhalation and suspension. Check there is no holding of breath or strain; that the pauses at the top and bottom of the breath are natural. 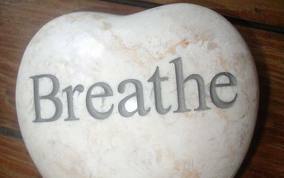 The more you stay with your natural breath, the more the breath will deepen and lengthen without effort or force. When we work with pranayama we are looking to cultivate two qualities: dirgha and sukshma. Dirgha means long and steady and sukshma means smooth and subtle. As we find the steadiness in breath, we find a steadiness in the mind, calming and quieting, soothing the nervous system. This in turn triggers a cascade of physiological changes: the heart rate slows down, blood pressure decreases and muscular tension is released. We discover that changes in the prana maya kosha (energy body) affect the physical and mental bodies. When we find the steadiness, quietness and space within these outer layers, we open a doorway to the deeper and subtler aspects of self. Our inner wisdom, intuition,creativity and spirit move into our field of awareness as the ripples of disturbance subside. Here is a simple pranayama practice. Enjoy!